A view of the Privy Garden, looking north. 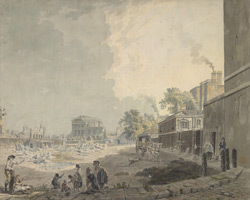 The view shows buildings, a crowd of local people and detail of a passing carriage. In the background is the Banqueting House, the only surviving part of the Palace of Whitehall, which was otherwise destroyed by fire in 1698.